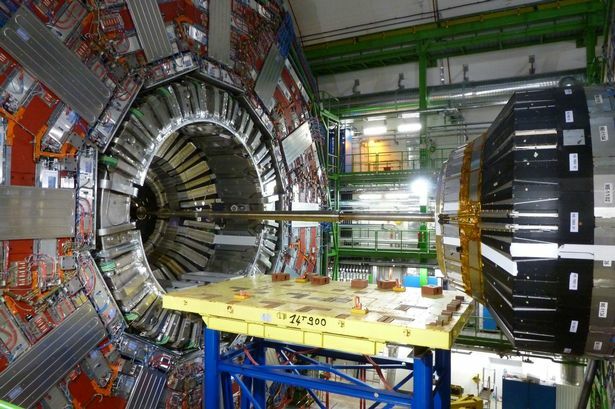 Birmingham scientists behind one of the biggest research projects in the world have said they hope the restarting of the famed Large Hadron Collider will usher in a ‘new era’ of knowledge. Finding ‘dark matter’ – new planets – is a key hope of the project, based in Geneva. By the end of the month the huge experiment involving the world’s biggest and most powerful atom-smasher will be switched back on after two years of upgrades. Scientists in charge of the collider revealed last weekend test beams of proton particles were successfully sent into the machine’s 17 mile circular tunnel. Soon they hope to start circulating the beams in earnest as the gradual process of building up energy begins. But it is likely to be another two months before the target energy level of 13 tera electron volts (TeV) is reached. Two years ago the LHC team at Cern, the European Organisation for Nuclear Research, astounded the world with the discovery of the Higgs boson, an elementary particle that gives other particles mass. This time their sights are set on an even more exotic prize, dark matter – the invisible, undetectable material that makes up 84 per cent of the mass of the universe and binds galaxies together, yet whose nature is unknown. One theory that could be tested suggests that the Higgs boson can give birth to particles of dark matter. British scientist Professor David Charlton, from the University of Birmingham, who heads the Atlas detector team, said: “We’re heading for unexplored territory. It’s going to be a new era for science. Besides looking for dark matter, the scientists will want to learn more about the Higgs boson, he said. According to a “new physics” model of the universe called supersymmetry, the Higgs might disintegrate into a photon – a packet of light – and a dark matter particle. Speaking at a news briefing at Cern in Geneva, close to where the LHC straddles the Swiss and French borders, the organisation’s director general Professor Rolf Heuer said: “We’re really excited because we’re entering a new phase of the LHC after two years of heavy maintenance and heavy improvement. “It will start some time this month – I hope in maybe two weeks we will see that we get the first protons circulating, but it will take some time. We have learned to be patient. The LHC smashes streams of protons – particles at the heart of atoms – and electrically charged particles of lead together at energies never attained before. The collisions, taking place in four giant detectors, spark the creation of new particles and allow scientists to peer deep into the fundamental building blocks of nature. In accordance with Albert Einstein’s famous equation E = mc2, energy can be converted into mass. And the more energy, the more massive the particles that can be created. After its re-fit, the LHC should be able to reach an energy level of almost double the 8TeV that produced the Higgs boson.